Cheap eats in danger: Save our taco trucks! It's May Day, traditionally international worker's day. A perfect day to go out and support the working man's favorite food source: The taco truck. 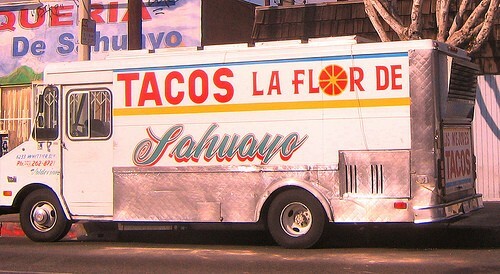 Ask any Angeleno: Taco trucks are as much a part of the L.A. landscape as pho places and sushi bars. They provide a source of delicious -- and affordable -- food for the working people of this city, Hispanic, Anglo, African American and Asian alike. But due to complaints from restaurant owners, the L.A. Board of supervisors passed a law two weeks ago that would slap a $1,000 fine on trucks parked in the same spot for more than one hour. That hits below the belt for most of these trucks, which are usually small family businesses. They argue that they serve a different population than restaurants, serving good food at affordable prices that even low-income workers can manage.And taco lovers of Los Angeles are rallying to their sides, surprising city leaders. Our sister blog, Slashfood, has more information here. Los Angeles is more than 50% Hispanic. The ongoing debate about illegal immigration and its impacts notwithstanding, Hispanic culture is the heartbeat of the city. The crossovers are everywhere: Every little Anglo kid has a pinata at their birthday party. Day of the Dead celebrations have become hip, with young Angelenos flocking to the Hollywood Forever cemetery to feast with their friends over celebrity graves. ABC's hit show Ugly Betty is an Anglo remake of the Mexican smash hit La Fea Mas Bella(The Prettiest Ugly Girl). People of all races line up at farmer's markets for tamales, or Salvadoran pupusas. Families come together for Las Posadas at Christmastime. Salsa music fills the streets. In a heartening sign of how intertwined the cultures have become, the fight to save the taco trucks is coming from the college-aged Anglo population, who have organized petition drives via social networking sites and blogs. The young people who've grown up in the Hispanic/Anglo mix see racist and classist overtones in the attempts to regulate the taco trucks. I can see the argument from the restaurant-owners' viewpoint, of course. But I think there's a big enough pie for everyone, so to speak. Surely the Supervisors can come up with a few creative solutions that ensures both venues enough customers to prosper.